Earth Conscious wins the Biteable Best of Beauty Award for Best Deodorant 2016 with their 100% natural organic deodorant, Hippy Paste. 100% Natural Deodorant that eliminates body odour without harming your body or the environment. Aluminium Free, Paraben Free, Cruelty Free and of course it works! “I've tried literally dozens of healthy deodorants, including making my own. Some were too messy, some didn't work very well, others were too expensive. This stuff is super easy to apply, works extremely. Winner. Rebecca Goodyear, Natural & Organic Beauty expert and founder of Biteable Beauty announced this year's winners in March. It’s fantastic news for the Earth Conscious brand to have won the Biteable Best of Beauty Award for Best Deodorant 2016 with Hippy Paste, a 100% natural organic deodorant. 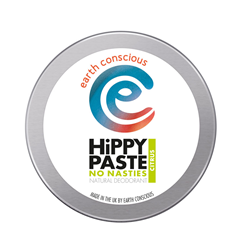 Hippy Paste is packaged in a sleek recyclable tin making it the best eco friendly deodorant too. Hippy Paste is made with 100% natural organic ingredients and is of course aluminium free, paraben free and cruelty free. Due to its tin packaging, it travels incredibly well making it perfect for everyday use - just pop it in your bag and away you go. Hippy Paste is ideal for travelling, camping and festivals too, so go check it out and Release the Hippy in you.